An extra-ordinary itinerary to discover the most authentic and romantic Tuscany, with its wealth of art, culture, wine and food treasures. Explore one of the most beautiful places in Italy: the Cinque Terre with its breathtaking landscapes. 9 Nights accommodation in exclusive and fascinating 4/5 stars Hotels or Historical mansions, with full buffet breakfasts: 3 Nights in Florence, 3 Nights in Chianti, 3 Nights in Cinque Terre. Welcome Honeymoon Package at your arrival in each hotel. 3 Lunches (in San Gimignano, in Montepulciano and with the cooking class in Florence) and Welcome Dinner in Florence. 2 beautiful wineries visits and exceptional wine tastings in San Gimignano and Montepulciano. Exclusive Italian Cooking Class and food market tour with an expert chef in Florence. Private sightseeing Tours with expert local English speaking Guides, including all the entrance fees to the sites visited: Florence (Accademia Gallery, Uffizi Gallery) – Siena (Piazza del Campo, the Cathedral) – Pisa (Leaning Tower). Full Day Excursion Val d’Orcia. Full Day and private hiking Excursion in the Chianti area. 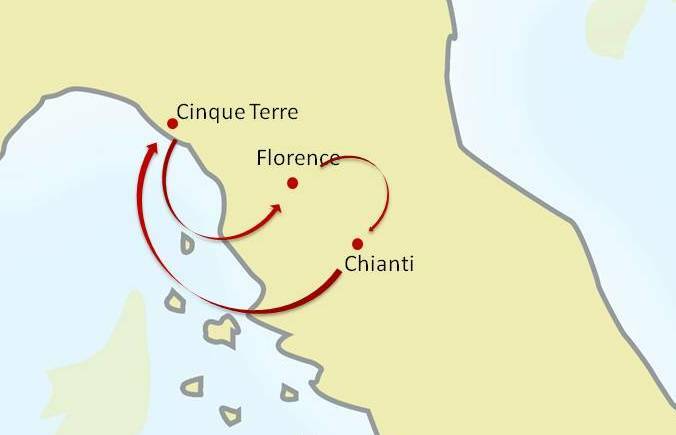 Full Day Excursion Le Cinque Terre. All private transfers by deluxe van with English speaking driver available for transfers and excursions for the entire Tour (including airport transfers). Tour begins and ends in Florence. Private Tour through the historical centre to admire the city landmarks, privileging its most characteristic corners. Accademia and Uffizi gallery included. Unique experience of cooking class with market Tour and Lunch with your own made meal. Enjoy the Wine area of Chianti with an amazing hiking Tour through the vineyards. In addition to vineyards and wineries, the Chianti offers beautiful old country churches, the so called "Pievi", well-preserved medieval hamlets and powerful castles, evidence of centuries of fierce battles for supremacy in this strategically important are. Full Day Excursion to visit the wonderful medieval town of Siena. Lunch in San Gimignano, recognized UNESCO World Heritage Site for the uniqueness of its landscape. Visit Val d’Orcia and admire one of the most beautiful Italian landscapes: the gorgeous medieval villages of Montalcino and Montepulciano and the beautiful Renaissance village of Pienza. Wine tastings in a celebrated winery in Montepulciano. Visit Pisa. Admire the city of the “Leaning Tower”, one of the most ancient cities of Italy, pioneering science and trendsetting, wealth of art and history. 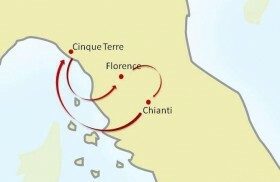 Full Day Excursion to discover the Cinque Terre. Five miles of rocky coast, covered in vineyards, five villages clinging on the cliffs that can be visited only by foot or by boat: from Riomaggiore, through the “Trail of Love”, until Manarola, the smallest village of the five. Then a short boat trip to Vernazza, the most picturesque of the villages, with small houses, alleyways and lodges. 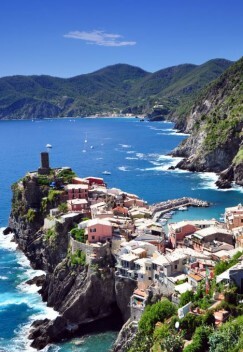 Pamper yourself in one of the most romantic places of Italy, enjoy the breathtaking sceneries of the Cinque Terre.